Spinning wheels (those we offer) are typically classified by their general appearance. As new concepts are developed, this classification becomes a little blurred, but basically you have Saxony wheels (horizontal), castle wheels (vertical), Norwegian wheels (horizontal on a bench) and what we call "modern", which can take on many forms, including folding wheels electric wheels. 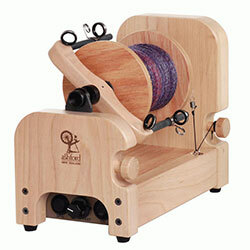 You can also purchase a spindle wheel which uses a spindle to hold the spun yarn, not a bobbin. These work like a great wheel. 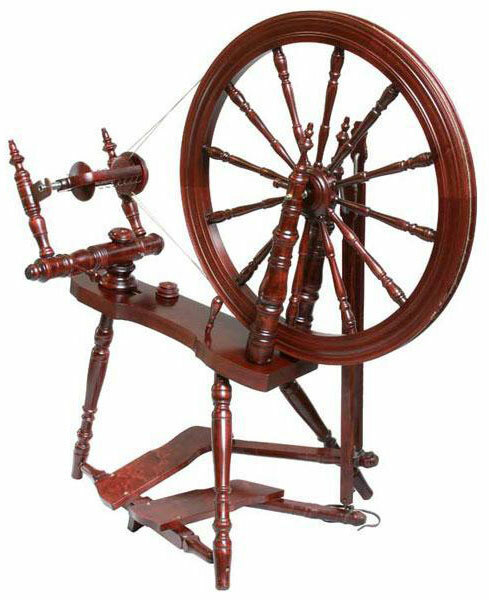 The Indian Charkha is a good example. This is the wheel of fairy tales - the wheel on one end, the flyer on the other, sloping frame, and normally three legs. Feature a side-by-side arrangement of the drive wheel and flyer (spinning head). The Ashford Traditional and Elizabeth 2; Kromski Symphony, Polonaise, and Prelude; Lendrum Saxony and Schacht-Reeves wheels fall into this category. Distinguished by the flyer being positioned above the wheel, these spinning wheels take up less floor space than other types of wheels. The Ashford Traveller; Kromski Minstrel and Mazurka; and the Majacraft wheels are good examples. They normally have three or four legs and in most instances are a bit more compact than other wheels. These are hybrids of other traditional types, usually taking on a more unusual appearance, and attempt to take advantage of better engineering. In this category we put the Louet wheels; Kromski Sonata; Lendrum Original; Schacht Sidekick, Ladybug and Flatiron; Babe's and the Ashford Joy. See our page that compares folding wheels. Designed to employ electricity rather than foot power to spin yarn . They do not feature a wheel, only a flyer. They can be set on a table and started manually. Easy to carry and store. Great for those who can not (due to physical limitations) or do not wish to treadle. They are not completely automatic since the spinner still determines the size of the yarn and must from time to time stop the flyer to change hooks in order to fill the bobbin evenly. Examples of these are the Ashford Electric Spinner, Roberta, and The Device. These wheels do not have a flyer or bobbin. A pointed spike is used to both twist and accumulate the spun yarn. 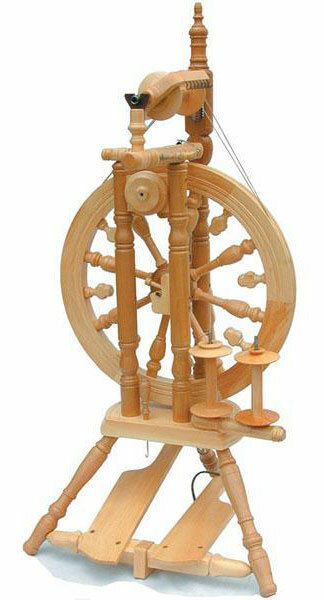 Examples can be found on our Charkha Wheel page.